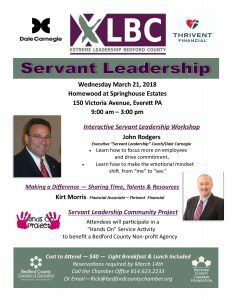 A networking lunch will follow with featured speaker, Kirt Morris of Thrivent Financial: Making a Difference – Sharing Time, Talents & Resources. Participants will join in an afternoon service project packing bags of essentials for Your Safe Haven clients. To register, call: 814.623.2233 or Click Here.